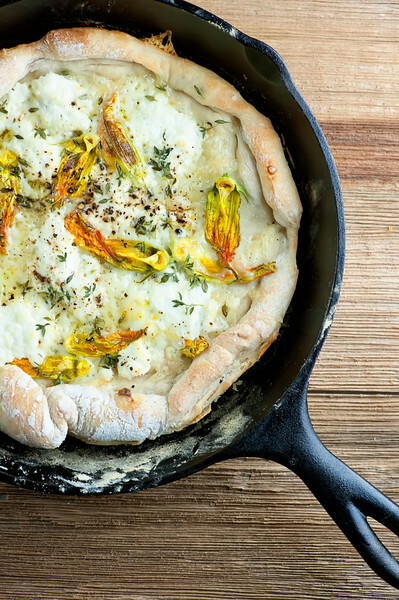 Cast iron skillet pizza can be customized all different ways with this easy recipe. From classic tomato and cheese to anything else you can dream up! You may never need that pizza delivery number again. Settle in with me for a while as I tell you about the joy that is cast iron skillet pizza. I’m all for ordering good old take-out pizza for much of the year, but when it comes to summertime and we find ourselves surrounded by a cornucopia of fresh tomatoes and herbs and other delicious local veggies, I pull out my trusty cast iron skillet and with just a little more effort than it takes to call in a delivery order we have a cheesy, melty pan full of pizza deliciousness. So if you want to put your own skillet to work making an explosion of fresh summer veggie pizza deliciousness, come along with me and let’s make it! You start with fresh pizza dough, which is increasingly available in the dairy/refrigerated section of your supermarket. You can also make your own, of course, and if you don’t already have a recipe, I recommend this one from the New York Times. It’s super easy, comes out perfectly every time, and yields a delicious crust that is substantial enough to hold the veggies we are going to adorn it with without being too thick and doughy. Cooking the dough for any variety of cast iron skillet pizza works exactly the same. Pour a couple of tablespoons of olive oil into the skillet and spread it around until the skillet is lightly greased. Now roll out your pizza dough into about an 11 inch circle and press it into the pan. Cook it over medium high heat on the stovetop until the bottom is set and the sides are starting to get a little golden. Now add your veggie and cheese toppings (more on those in a sec) and pop the pizza, still in the skillet, into a piping hot oven and let it cook up until the cheese is melty, about ten minutes or so. If one of your toppings is basil (and it definitely should be for one of the many pizzas you will want to make), save a little back to sprinkle on the finished pizza. Once the pizza is done, slide a spatula or two underneath it and transfer it to a cutting board for slicing. Now, about those toppings…here are a few of my favorite combos. My very favorite is sliced heirloom tomatoes with a combo of thinly sliced fresh mozzarella, a few dollops of ricotta cheese, and some basil. Sweet and salty and cheesy perfection. 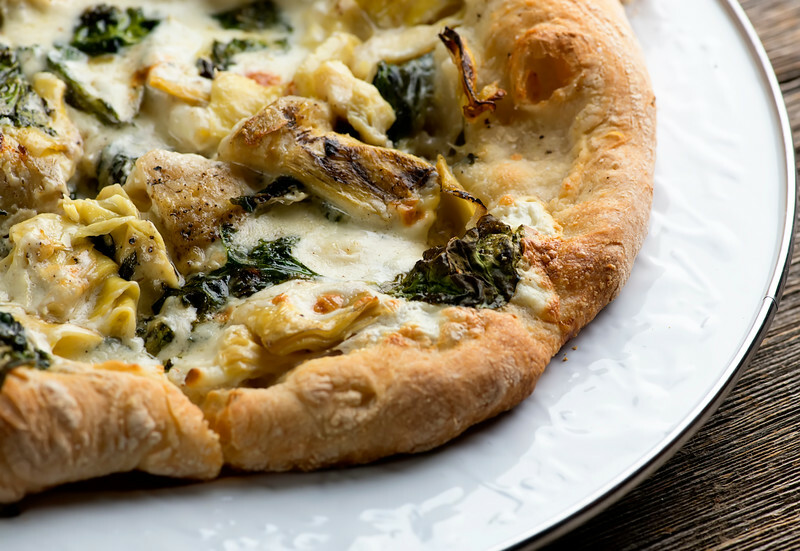 The Southern husband is a white pizza lover, so I made this version with artichoke hearts, some cooked baby spinach, and shredded fontina cheese. OH MY GOODNESS. And one lucky day my local farm market had zucchini blossoms, so I tossed them onto this pizza with shredded fontina, fresh ricotta, a little grated parmesan, some fresh ground pepper and a little fresh oregano. And by the way, here comes my regularly scheduled plea for you to try making your own ricotta. SO EASY. SO GOOD. Is your mind swirling with the possibilities yet? My best advice is to drop in to your local farm market (click here to find it), gather up whatever fresh veggies catch your fancy, and let your imagination run wild. The recipe below is for the general method for cast iron skillet pizza, but just know that as long as you have veggies and cheese in the mix, you pretty much can’t go wrong. Happy pizza-making, and let me know if you come up with any versions that I need to know about! 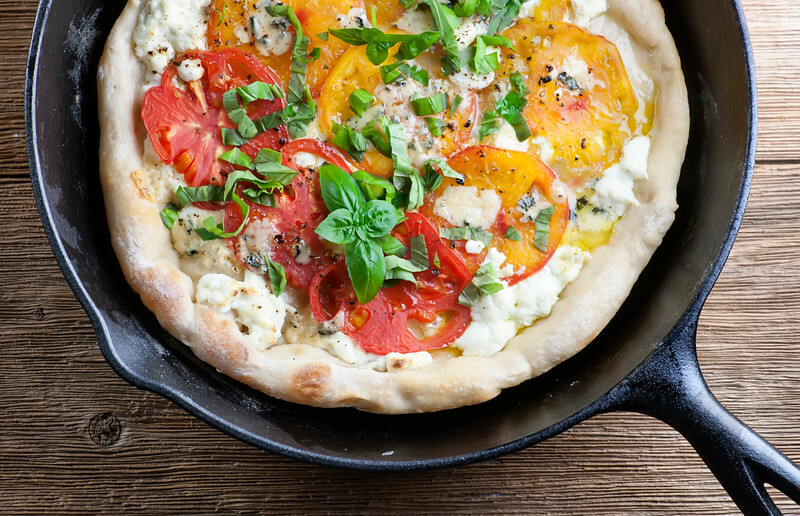 Cast iron skillet pizza can be customized all different ways with this easy recipe. From classic tomato and cheese to anything you can dream up! About 8 ounces of your favorite cheese at room temperature. Thinly sliced mozzarella, fresh ricotta, goat cheese, shredded fontina, crumbled blue cheese and crumbled feta are all great choices! About 1 cup of your choice of vegetables. Thinly sliced heirloom tomatoes, thawed artichoke hearts, sliced sweet onion, squash blossoms, sautéed baby spinach are all wonderful. I’ve even used sliced peaches! Your choice of fresh herbs, chopped. Rosemary, basil, oregano, chives, thyme, etc. If you are using basil, hold a little back to sprinkle on the finished pizza. Preheat oven to 500 degrees, and pour oil into a 12 inch cast iron skillet. Spread the oil around with a paper towel until the skillet is coated. Shake a litte flour onto the rolling surface and roll the dough into a roughly 11 inch circle. Press it into the skillet, pushing the edges up around the side a little. Cook the dough over medium high heat on the stove until the bottom is set and starting to brown underneath (lift it up with a spatula and peek! ), about 3-4 minutes. 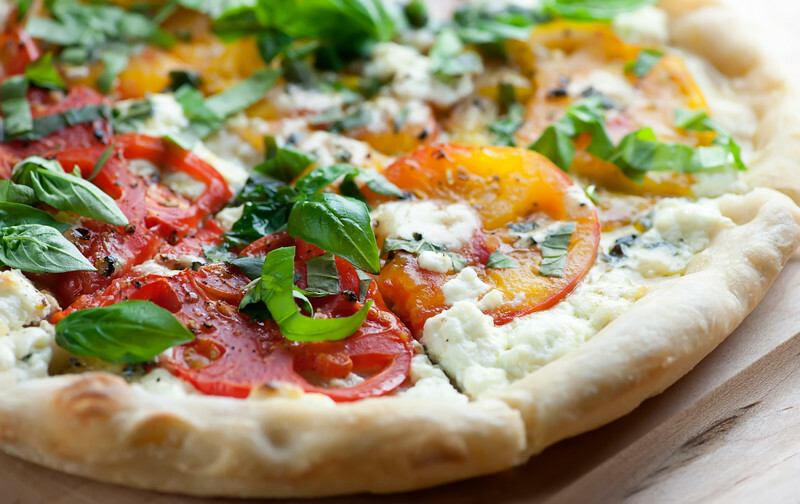 Spread your choice of cheese or cheeses on the dough, and then scatter veggies and herbs on top. If you are using parmesan cheese, sprinkle that on top of the veggies. Put the skillet in the oven and cook for about 10 minutes, until the cheese has melted. Remove skillet from oven and transfer pizza to cutting board (I usually use two spatulas to do this. Cut into wedges and serve! Oh my gosh this looks amazing!!! Could you do it with pizza sauce as well? I can imagine it being ridiculously good with sauce, cheese, and veggies!! Will be trying as soon as possible!! Pizza crust is a blank canvas for every meal, including dessert! Scrambled eggs, sausage and bacon with some shredded cheddar and Jack cheese for breakfast. Ham, turkey, salami and provolone with tomatoes for lunch. Taco sauce, taco meat, black beans, and shredded cheddar for a taco supper pizza. Toss on some chopped tomatoes, lettuce, crunchy Taco-flavored Doritos and a dollop of sour cream after if comes out of the oven (or off the grill!) to make it really taco-ish. Our dessert pizza is spread with Nutella and topped with crushed cookies of choice and a drizzle of melted white chocolate and, sometimes, raspberry sauce. Or caramel sauce, depending on the other toppings. The crust is fully cooked for this one before topping so you don’t end up with a melty mess. Your favorite chopped candies and some crushed pretzels also make for a mighty fine pizza for dessert. I use my cast iron skillets all the time for pizza now. And I don’t even bother with rolling the dough; I just plop into the greased pan and push it around the bottom to spread it out. Another winner, Kate! Thanks for sharing! Teresa, I always always ALWAYS love your comments, because you always give me so many amazing ideas! I mean, DESSERT PIZZA? Oh my gosh yes. Thank you my friend! Ooo I love all the different topping combos you tried!! I just got a cast iron skillet and I’ve been itching to use it so I can’t wait to try this out :) . I love pizza in a cast iron skillet Kate! And you know I’m loving all the Jersey fresh veggies, especially those juicy red tomatoes!! Love your zucchini blossom version!